Don’t fall for bad credit car loans or buy here, pay here scams. Learn how to use a peer loan to buy a car. Eight years after bad credit home loans almost destroyed the financial system in American and I think I’m having déjà vu. 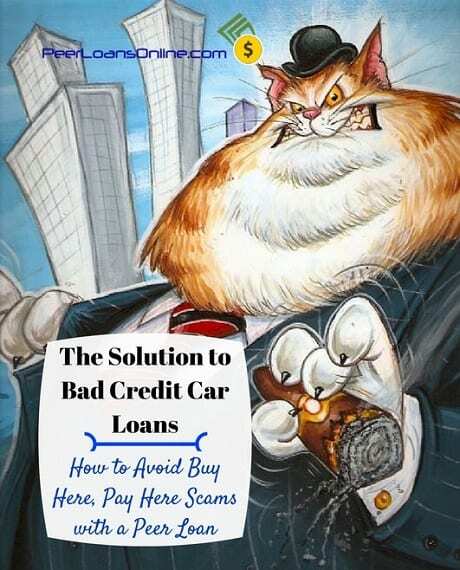 Bad credit car loans and rip-offs at buy here, pay here dealers are building to lead to the next great recession and borrowers are getting scammed. Rates as high as 30% on cars not worth half as much as the asking price are putting people in a bind but many believe it’s there only option on poor credit. The solution may be in using another type of loan to avoid the high prices and deceptive practices on bad credit car loans. Using a peer loan to buy a car can help you get the right car at the right price and avoid ruining your credit score in the process. Auto sales jumped after the 2009 cash for clunkers program. More than half a decade after the trade-in program, car dealers don’t want to see the good times end. They’ve resorted to relaxing loan standards and raising the price on cars to keep profits growing. Loans on motor vehicles have increased at an average 7.6% pace since 2011. That’s four-times the 1.9% annual growth in real disposable income for households during that time. How do bad credit car loans keep increasing even on slow income growth? Almost a third (29%) new loans in the last quarter of 2015 were for terms between 74 and 84 months. That’s three times as much as just a few years earlier. Longer loan terms means dealers collect that juicy 30% rate for longer and have a better chance of getting the car back in a repossession. The graphic below shows the total interest paid on a $5,000 car loan at 30% over different loan terms. You end up paying more than $12,000 for a car you agreed to pay $5,000 and probably isn’t worth more than a few grand! Even on the traditional 60-month car loan, you end up paying just as much interest as you paid for the car. Rates on bad credit car loans at buy here, pay here dealers are as high as 30%, the maximum allowed in most states. To get around the cap in car loan rates, dealers mark up the price of the car as high as 50% over their price. On a 50% markup, the interest rate on a 74-month bad credit car loan is actually 51% a year instead of the stated 30% rate! 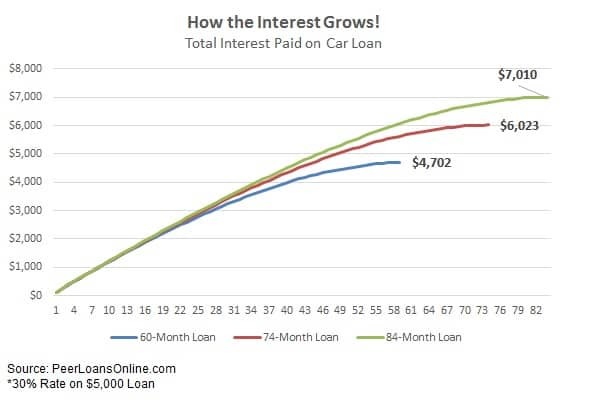 You’d end up paying $4,614 in interest on a car worth $2,000 over the 74-month loan. Rates on car loans at buy here, pay here are as high as 30%, the max allowed in most states. If that weren’t enough, car values are marked up way above their worth. Dealers don’t worry about the loan because they get the car’s value on the down payment and can repossess-resale the car as many times as they like. These scams at buy here, pay here dealers are starting to show. Almost a third (31.4%) of cars traded in last year owed more than they were worth. The percentage of bad credit car loans (subprime) late by more than 60-days jumped this year to the highest in two decades. For a lot of car buyers with bad credit, there may not seem like much you can do. Bank loans have all but dried up even for good credit borrowers and you might not have much for a down-payment. The legitimate used car dealers probably aren’t going to take a chance or might just farm your loan out to one of the bad credit loan companies. The answer may be in getting your money before you even go to the car lot. Peer to peer loans on websites like PersonalLoans and Avant are available for up to $35,000 and you can use the money for whatever use you need. Getting a peer loan ahead of time is going to keep you on your budget, making it less likely you’ll fall for the dealer’s upsell tactics. You’ll have the money in hand and can go to any dealership you want, not just the buy here, pay here lots that will give you credit. Besides using peer lending to buy a car, it can also be used for debt consolidation and lowering your interest rate. Rates on bad credit peer lending can get high as well but you’ll be able to go to a legitimate dealer and pay a fair price for your car. Peer loans don’t include the prepayment penalties you see in a lot of car loans so you can pay the loan off early and save on interest. Peer to peer loans are available on 36- and 60-month terms on most of the sites in our guide to peer to peer lending. Make sure you look around for a car you can afford before looking for a loan. Only borrow as much as you need for your car so you don’t get tempted to overspend on that shiny new hot-rod. Understand that peer loans are just like any other loan and can hurt your credit score if you don’t make payments. Your car can’t be repossessed if you default on the loan since it’s a personal loan but that doesn’t mean it’s free money. You don’t have to be the next victim of bad credit car loans or buy here, pay here scams. Learn how to use a peer loan to buy a car but do so responsibly. You’ll end up saving on interest and won’t have to worry about getting scammed by shady car dealers.